Provide comfort for the family of Adele Angle with a meaningful gesture of sympathy. 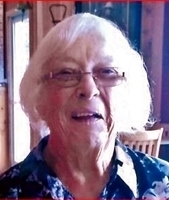 Adele Jeanette Angle, passed away on Monday, February 4, 2019 at the age of 76 at Community Hospice, Hughson, California. Adele was born January 5, 1943, in Hayward, California to Howard and Josephine Shipman. Adele graduated from Oakdale High School and attended Modesto Junior College. She worked various jobs in her career including working for Dr. Lucky in Stockton, the Stanislaus County Welfare Department, and several years at Oakdale Hershey Chocolate Factory, from where she retired. Adele and her late husband, Eldon, lived in Modesto for 10 years and lived 25 years in their beloved ranch home in Oakdale. Adele is survived by her brother, William (Janice) Shipman, Niece, Hilary Aviles (Saul) – great niece Angelina Aviles, Nephew Derek Shipman (Natalie) - great nieces, Lily Shipman and Josephine Shipman. Adele is also survived by her sister -in-law Glenda Sue Gayhart, step sons Derek Brown (Diane) and Duane Angle, step-grandchildren, Lexi Brown, Riley Brown, Sara Otto and many cousins. Adele is also survived by close friends Jim & Connie Tanquary, Gary & Olean Shipman, Jim & Georgette Leach, and Anna Lou Carnes. The love and support from the whole Angle family is much appreciated. Adele was preceded in death by her husband, Eldon Lee Angle, parents-in-law Randawl Dee and Margaret Angle, step-son Jimmy Angle, step-daughter Shannon Angle, step-brother Randawl Leroy Angle, and step-sister Lenda Brashier. Adele is also preceded in death by her parents, Howard and Josephine Shipman, her grandparents Ray and Mildred Shipman, and John and Frances Medina. Funeral services will be held at Oakdale Memorial Chapel, 830 West F Street, Oakdale, CA 95361 on Tuesday, February 19, 2019 at 10:00 a.m. with graveside services at Lakewood Cemetery, 900 Santa Fe Avenue, Hughson, CA 95326 immediately following. Family visitation is on Monday, February 18, 2019 from 3:00 p.m. to 7:00 p.m. at Oakdale Memorial Chapel. To plant a memorial tree in honor of Adele Angle, please visit our Heartfelt Sympathies Store. We encourage you to share your most beloved memories of Adele here, so that the family and other loved ones can always see it. You can upload cherished photographs, or share your favorite stories, and can even comment on those shared by others.